Calculation of voltage imbalance for loads served by unbalanced transformer banks is very complicated. Unbalanced transformer banks include open connections such as open-wye / open-delta and open-delta / open-delta, or banks of three transformers with unequal impedances or kVA ratings. Also, unbalanced loads are often applied to three-phase banks, particularly banks with delta secondaries serving 120/240 V on one leg to serve single-phase loads, as well as 240 V three-phase loads. Calculation of loading on the individual transformers in the bank is complicated, particularly when the application does not fit the "cookbook" assumptions of equal power factors for the single-phase and three-phase loads, and equal transformer impedances. The program is graphically oriented and very user friendly. The figure above shows a screen shot of the main screen. The circuit diagram shown on the main program screen changes dynamically with the transformer connection chosen. GSVIC calculates voltages, currents, and transformer loadings for all transformer connections typically used in distribution systems. That balancing effect of motors is included in GSVIC’s calculations because the program correctly represents the sequence-component impedances of the motor. 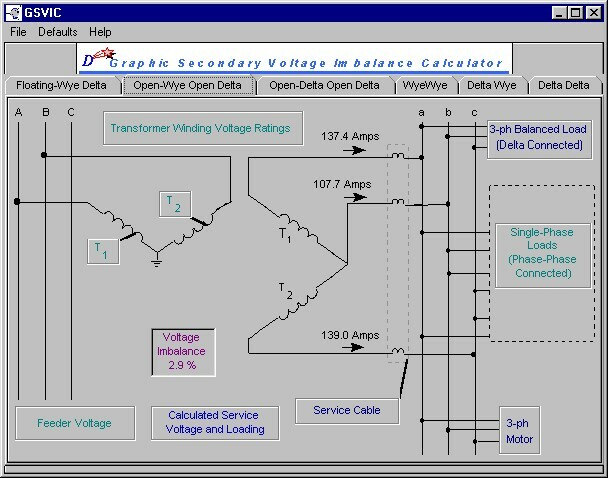 The window shown above is the summary output produced by GSVIC, showing voltages at the service, voltage imbalance, the derated motor mechanical output due to the voltage imbalance (if a motor is modeled), and the individual transformer loadings. Voltage imbalance is shown both in terms of the negative sequence magnitude and the "NEMA" definition, which is the maximum difference of any one phase from the average phase voltage. The negative sequence impedance is the true measure of motor impact, but the other definition is used in the NEMA standard because it is easier to measure in the field. GSVIC also provides a much more detailed output report, which gives voltages and currents at each point of the system in both phase and sequence component form. Transformer loading when serving single- and three-phase loads from a three-phase bank. For example: a utility has previously bought transformers with a 2.1% impedance. They are considering a attractive quote for transformers with a higher impedance. They are concerned that the new transformers cannot be used to replace a failed phase on existing banks because the impedance mismatch might cause excessive voltage imbalance. 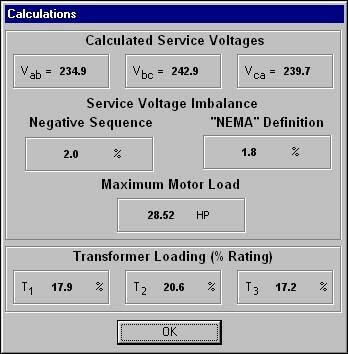 Using GSVIC, the utility was able to calculate the impedance limits for a replacement transformer which does not result in a voltage imbalance greater than 1/2 of a percent.